A Thought Experiment: HELIUM-3 WILL WARM US. during multi-year journeys to the stars. What Power?? On Earth, humanity gets life support power directly from Sol. However, interstellar flights will spend long periods between stars; since power decreases per distance squared, vessels won't get much power from stellar radiation. How will the onboard flora and fauna flourish without solar energy?? BACKGROUND: Recall three phase profile of thought experiment's typical interstellar profile from Sol to AC. Accelerate at g-force for perhaps a year. Previous work indicates that 365.26 days of g-force acceleration achieves cruise velocity, VCru, 63.8% c, light speed, for a distance of about .38 Light Year (LY). Einstein conducted thought experiments to determine Principle of Equivalence: "occupants will not distinguish between g-force accleration or being static on Earth's surface". Thus, the g-force which accelerates the spacecraft will also impart near Earth gravity throughout the vessel. Our Thought Experiment (TE) assumes that fuel limitations will restrict acceleration duration to about one year. Cruise at VCru for several years. TE considers it impractical to for an interstellar vessel to carry enough fuel to accelerate for entire interstellar flight; thus, the vessel needs to spend a long portion of flight at a constant velocity "cruise" phase. 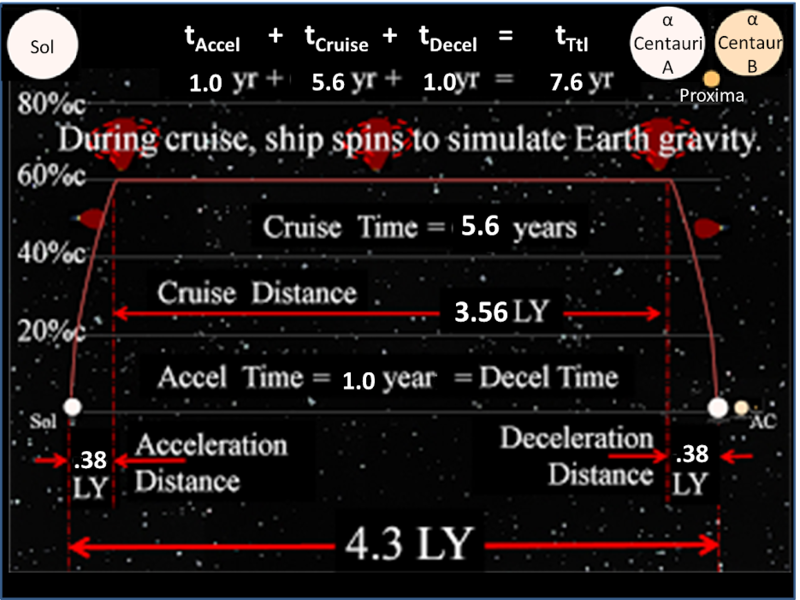 Fortunately, a year of g-force acceleration brings this constant velocity to a significant portion of light speed, c. For example, Sol's nearest stellar neighbor is Alpha Centauri, about 4 LYs away; .638c makes the cruise time about about 6 years (tCru= 4 LY / .638c = 6.3 years ). Decelerate at g-force for same duration as acceleration. This reduces ship's velocity down to operational speed at destination. Perhaps auxiliary power needs for interstellar vessel can feed off of propulsion system just like auxiliary power planes, trains, and automobiles uses small portion of main power for auxiliary needs. This might also apply for the Deceleration Phase. Cruise Phase. Having achieved a significant portion of light speed (.64 c), travel time between stars reduces from centuries to just years. Since g-force propulsion will be off for cruise phase, near Earth gravity is maintained by spinning the habitat section of the vessel just like asteroidal habitats will have done for centuries back at the Solar System. Just like habitats in the Solar System, interstellar cruise habitat's power needs will need the most effective fusion fueled power; the subject of this chapter. For the long cruise phase of interstellar flight, propulsion is off and the ship travels at constant velocity. With no propulsion, how does the vessel satisfy the continuing power needs of the sizable onboard population? Vessel will need to transform from an accelerating g-force vessel to a spinning habitat and simulate gravity via centripetal force. (Note: TE assumes habitat to be a hollowed out asteroid with living quarters for relatively large populations). Sunlight will definitely not be available. Fusion power must be available, and it must be the most effective fusion power; thus, Helium-3 (3He) comes in. While sunlight might provide essential power for vessels close enough to sun (after all sunlight now powers the planet, Earth), sunlight density disperses quickly with distance, and vessels well beyond Earth orbit will need another long term reliable and safe power source. 1) A gas giant, perhaps Uranus, can be mined for huge quantities. Since the 1950s, scientists have pursued much more efficient energy methods by fusing Hydrogen isotopes into heavier elements. However, third generation fusion reactions won't need Hydrogen isotopes. Deuterium and tritium fuse most readily; their nucleonic electrical charge is the lowest of all elements. A deutrerium nucleus fuses with a tritium nucleus to form an alpha particle (4He nucleus) and a neutron. The resultant products convert a small amount of mass into about 17.6 million electron volts (MeV) of kinetic energy. PROBLEM: Above neutrons have no electrical charge and can't be controlled by magnetic fields. Thus, as an unwanted byproduct of first generation fusion reactors, neutral neutrons disregard magnetic forces and fly off into the walls of a fusion chamber, making them radioactive. Destructive power of those neutrons is cumulative and eventually adds up. After several years, reactor walls irradiate beyond repair and must be replaced. Also, this process creates large volumes of high-level radioactive waste. Second generation fuels (Deuterium and Helium-3) generate more energy than first generation fuels, but they require much more stringent confinement methods. A Deuterium atom fuses with a Helium-3 isotope (3He) to to produce a proton and 4He nucleus (also known as an "alpha" particle). Sum of components going into the reaction weigh more then the reaction results;because the missing mass converts to energy. This is currently the most promising process for power generation; this is due to the nature of its reaction products. Most other fusion processes produce radioactive neutrons which bombard reactor components and eventually render them useless. In contrast, Helium-3 itself is non-radioactive. Fortunately, magnetic fields can contain high-energy protons and generate electricity. PROBLEM: Inevitable side reactions (D-D fusion) result in minor low energy neutron production; thus, second generation fusion reactions will most likely never be completely 'clean'. Helium 3 fusion would be ideal for powering spacecraft during the long stints of interstellar travel. While offering fusion's high performance power, 3He-3He reactors would require less shielding then the 2nd generation process. (3He-3He) "third generation" fusion power fuses many Helium-3 atoms, to produce only protons and alpha particles with total energy of 12.9 MeV; this eliminates stray neutrons and radioactive waste. Third generation fusion fuels produce only charged particles in the primary reactions. With almost no neutrons, there would be little induced radioactivity in the walls of the fusion chamber. This is often seen as the end goal of fusion research. 3He has the highest Maxwellian reactivity of any 3rd generation fusion fuel. 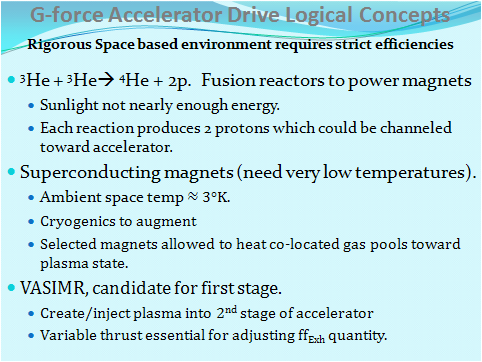 Thought experiment assumes 3rd Gen. fusion reactors will be essential for starship's auxiliary power needs. In this regard, Helium-3 (3He) might prove an essential resource for interstellar travel but not necessarily directly toward propulsion. This fusion process might provide essential power for the many power hungry life support processes as well as some components of the accelerator. In this aspect, 3He might someday become an essential part of the propulsion process. Finally, TE speculates the resulting two charged protons can recycle back into the fusion process. Along with the proton stream anticipated from the Interstellar Ramjet’s magnetic collector, TE assumes these numerous protons can process into Deuterium atoms (where one proton becomes a neutron), and subsequent D-D interactions can create yet more Helium-3 atoms. therefore, it might be the optimal mining site for Helium-3. Mining operations would require a mix of artificial intelligence (AI) and human activity. Gerald Kulcinski, director of the University of Wisconsin's Fusion Technology Institute, manages the "inertial electrostatic confinement device," an experimental low-power reactor that has successfully used lasers to perform continuous deuterium-helium-3 fusion. From steady-state deuterium-helium 3 plasma, FTI researchers have achieved 1.5 x 108 p/s (as of May 2001). This was done in a small reactor with a basketball sized chamber; as a side effect, it produces some radioactive waste thought much less than the standard deuterium-tritium fusion reaction. "Proof of principle," says Dr. Kulcinski but the next generation of Helium-3 fusion reactors will perform better and be completely free of radiation. Pure Helium-3 fusion (3He-3He) is a long way off, but it's worth the effort, says Kulcinski, "You'd have a little residual radioactivity when the reactor was running, but none when you turned it off. It would be a nuclear power source without the nuclear waste."